Network service providers are finding it increasingly difficult to keep pace with consumer bandwidth demands while at the same time maintaining reasonable service pricing. They are addressing this by moving away from proprietary network appliances to more open systems using high volume multi-core Intel® processors to reduce system cost and streamline software development ...efforts. This movement is also embracing Software Defined Infrastructure (SDI) concepts such as Network Functions Virtualization (NFV) which can provide agile services and lower Total Cost of Ownership (TCO) when combined with other industry initiatives such as network virtualization overlays and software defined networking. 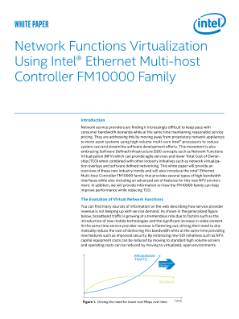 This white paper will provide an overview of these new industry trends and will also introduce the Intel® Ethernet Multi-host Controller FM10000 family that provides several types of high bandwidth interfaces while also including an advanced set of features for this new NFV environment. In addition, we will provide information on how the FM10000 family can help improve performance while reducing TCO.